The Big Jack knows just about every thing there is to know about sports and he will let you know it. He played baseball as a youth through high school and tried out for major league clubs. After his baseball career was over, he began pro wrestling. At his size he was an instant hit. But as the years pass, it takes a toll on a wrestlers body and wasn’t wrestling much when he and Dan the Man met. However, he was still “working” (industry talk) when he met Mr Fantasy, he was. In the time that Mr Fantasy and Dan the Man wrestled, they were never able to pin the Big Jack. In the spring of 2012, Sports Time Radio began as the baseball season began. Joined by Mr. Fantasy, the Big Jack & Dan the Man made their predictions for the 2012 season. The Big Jack not only predicted that the San Francisco Giants would win the World Series winners, but also picked 2012’s AL MVP & Triple Crown Winner, Miguel “Miggy” Cabrera. 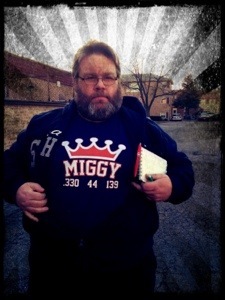 Shortly thereafter, he received a nice consolation prize for his efforts, that Miggy Tshirt ^Pictured above^ In 2013, He predicted that the Chicago Blackhawks would win the Stanley Cup and that the Seattle Seahawks would win the 2014 Superbowl.